We’ve made considerable progress on the upper level of the activities building. Ryan Mansager, Lucas Cecil, and James Duenow have completed nearly all the framing. Dave Turmenne, who travelled from Maine with his family to be here for Pentecost, donated several days to the ministry providing invaluable assistance. As a master electrician by trade, he ran most of the electric for the upstairs. 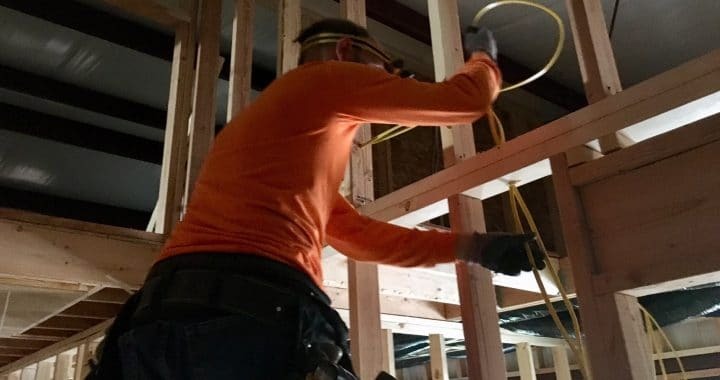 In addition, this week Pastor Randy Folliard and Levi Mansager installed the insulation in the rooms. The installation of the drywall is scheduled to begin on Tuesday, two weeks ahead of schedule. The immediate need this building will provide is lodging for the upcoming Feast of Tabernacles. It will also be used for other group functions throughout the year. If you would like to assist with this building, we are in need of donations. To learn more, including how to donate, visit our building fund page. We warmly invite you to this year’s Feast of Tabernacles in Holts Summit, Missouri. Along with daily worship services and several Bible workshops, we have many activities planned for young and old, including: roller skating, volleyball, bingo, Hebrew dancing, puppet show, bounce house, and more. As for lodging, we have two remaining dorm rooms in our new activities building and several electric tent sites. If you are interested in a dorm room, we encourage you to register soon. Because these rooms are limited, they are only available to those who plan to observe all eight days of the Feast with YRM. There is also one hotel, America’s Best Value Inn, in Holts Summit, two miles from the Assembly. This Feast promises to be a blessing and a taste of the Kingdom. Don’t delay, register today. For more information, visit https://yrm.org/tabernacles-2018. For those who watch our live Sabbath broadcast, we apologize for last week’s outage and technical issues. The problem was caused by a recent software update. We are working to resolve these issues and hope to have everything running as normal tomorrow. For those unfamiliar with this service, we broadcast live our Shabbat service every Saturday at 1:30 pm, Central, from yrm.org/live. Why do you believe that baptism into Yahshua’s name is required for salvation? Can you provide Old Testament passages confirming the Messiah? Do you believe that all the evil people who have died will be given the chance to repent during the Last Great Day? Why do you spell out the word “God”? Isn’t “God” basically the English rendering of Elohim? What is the meaning and significance of Wormwood? As believers, it is our responsibility to judge those outside the assembly. As believers, it is not our obligation to judge those in the world and outside the assembly. In 1Corinthians 5:9-13 Paul states, “I wrote unto you in an epistle not to company with fornicators: Yet not altogether with the fornicators of this world, or with the covetous, or extortioners, or with idolaters; for then must ye needs go out of the world. But now I have written unto you not to keep company, if any man that is called a brother be a fornicator, or covetous, or an idolater, or a railer, or a drunkard, or an extortioner; with such an one no not to eat. For what have I to do to judge them also that are without? do not ye judge them that are within? But them that are without Elohim judgeth. Therefore put away from among yourselves that wicked person.” While we are not to judge those without, Paul states that we are to judge those within the body of Messiah. Judge here is not to condemn, but to discern right from wrong.